What was for lunch at our house yesterday, you may ask? 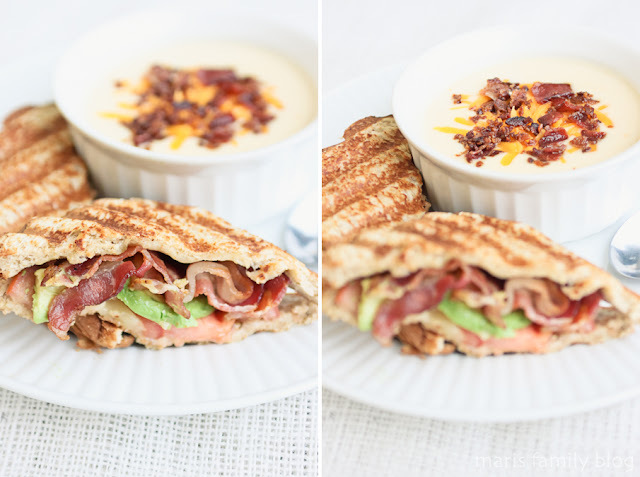 Wisconsin cauliflower soup and bacon avocado grilled cheese sandwiches! My mouth is watering just typing those words (and looking at these photos). It was absolutely fabulous! 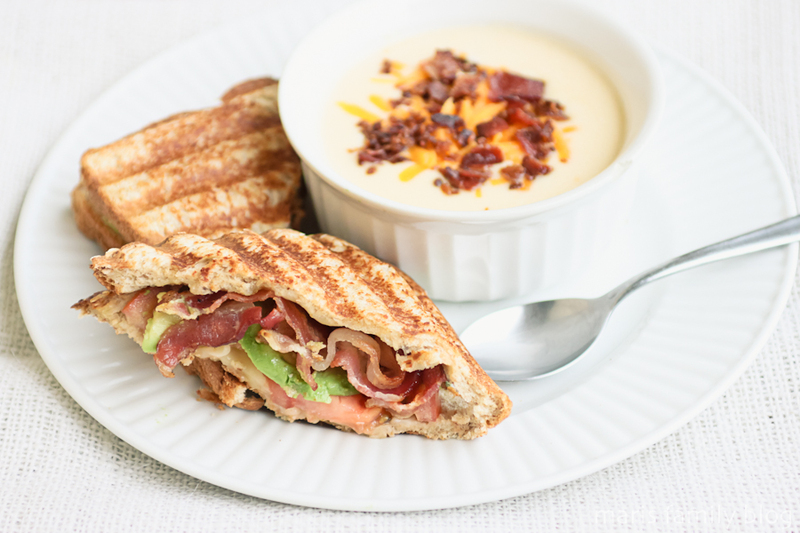 If any of you have been to Cafe Zupas, you may have had this velvety, creamy goodness, but where there is no Zupas, you can make it right in your own kitchen! I found a similar recipe here, and tweaked it just a tad. So, here you go! 1. In 4-quart saucepan, melt margarine or butter over medium heat. Add onion and cook until golden, about 10 minutes, stirring occasionally. Stir in flour and salt; cook 2minutes, stirring frequently. Gradually stir in milk, chicken broth, and 1 1/2 cups water; add cauliflower and heat to boiling over high heat. Reduce heat to low; cover and simmer until cauliflower is tender, about 10 minutes. 2. In blender (with center part of blender cover removed to allow steam to escape, but cover with papertowel/cloth to avoid splashing of hot liquids), blend cauliflower mixture at low speed in small batches until very smooth. 3. Return cauliflower mixture to saucepan; heat over medium heat until hot, stirring occasionally. 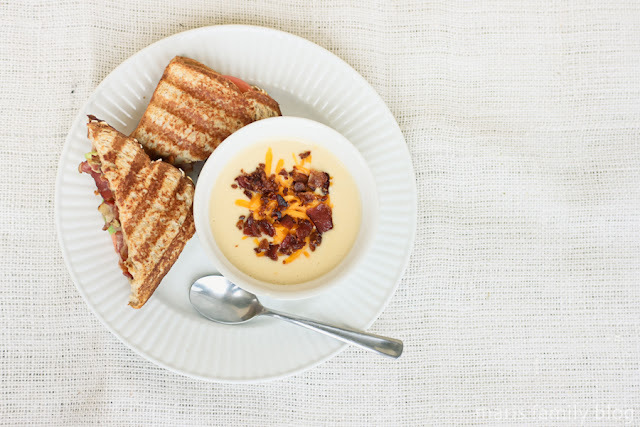 Remove saucepan from heat; stir in mustard and slowly add 1 1/2 cups cheese until melted and smooth. 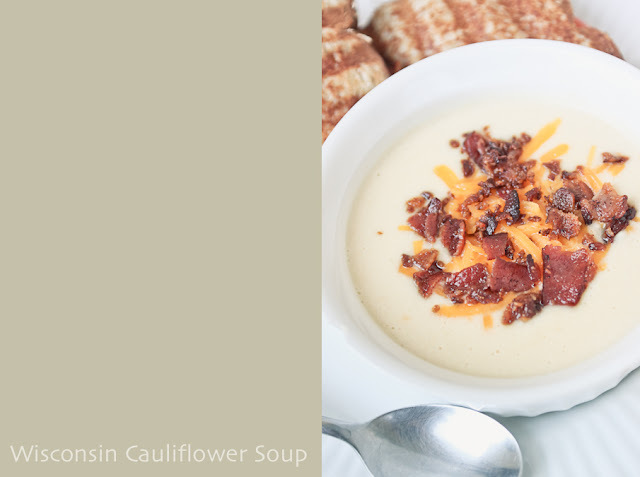 Garnish soup with remaining cheese and crumbled bacon and serve. For the grilled cheese we crisped up some bacon, cut up fresh avocado and tomato, stacked on some pepper jack cheese, and grilled it with a little bit of butter. Perfection! 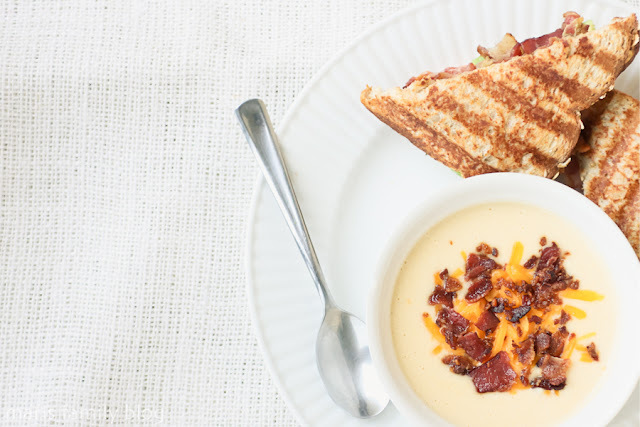 It definitely hit 'the spot,' and seriously the most comforting food for a rainy cold day.